Properties in Province of Córdoba average 4.6 out of 5 stars. Apartment TREEHOUSE Cordoba Parking & Wifi free. Property 18: Apartment TREEHOUSE Cordoba Parking & Wifi free. Property 26: Central floor of 123 m. with parking, air-conditioned, wifi, next to the town hall. 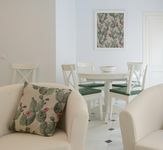 Property 30: Beautiful 3 Bedroom Villa With Private Pool in peaceful rural Andalucia. You'll already be thinking of coming back as you leave us! Property 36: You'll already be thinking of coming back as you leave us! Property 37: Comfortable and Spacious Traditional Farmhouse With Spectacular View and award. 'El Mirador de Iznajar' with swimming pool & breathtaking lake views (WIFI). Property 45: 'El Mirador de Iznajar' with swimming pool & breathtaking lake views (WIFI). PENTHOUSE 75m2. With terrace overlooking the old city wall. WIFI. Very quiet. Property 49: PENTHOUSE 75m2. With terrace overlooking the old city wall. WIFI. Very quiet. The apartment was very clean, organized, comfortable and well-equipped. The hostess was very attentive, and after introducing us to the apartment, made a second visit to give us additional information. The apartment faces a pedestrian-only street in a business-entertainment district so parking is not easy or obvious (our Volkswagen GPS system did not recognize the pedestrian-only nature of the street which led to confusion in locating the address). Our hostess led us to the parking garage and ensured that we were accommodated. Leave the car in garage! So, a couple of cautions. Due to the location and the local habit of very late night entertainment, street noise penetrates the apartment until early in the morning. A good set of earplugs is recommended for sleeping. The apartment has two bathrooms but the smaller bathroom is really not suitable for showering. The shower is a kind of a half bath tub which is very awkward to use and does not have a slip-proof pad or lining. One of our party did experience an alarming slip. 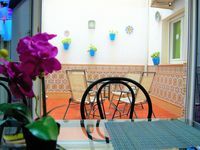 A good location at a reasonable price for walking to the sights of Cordoba.